Is there a prescription for prayer? This week we are going to look at one of the most well known prayers in the Bible, The Lord’s Prayer. Look at Matthew 6:9-13 as the source of our study. The Lord’s prayer is a guide, like a directing arrow which leads to hope and a promise. In the Jewish culture, the Kaddish is similar to the Lord’s prayer. Jesus took this prayer and turned it into a lesson. From the outset of this prayer the Lord showed us to praise God, first. (Love God first with all your heart and soul.) There are 6 principles outlined in this guide to prayer in the Word. As we look at this prayer, modeled by the Intercessor Himself, we can see the path that brings us to the place of communion. It isn’t about following the principles in any one specific order, as much as the entreaty to COME. The single most important aspect of prayer is the act of coming to the prayer closet. That initial step of coming to the Lord out of reverent realization of our need to be filled by His mercy and grace is most important. Just Come! Come as you are, broken and burdened by struggle, joy filled and shouting with praises, saddened and sorrowful by hurts, prideful and hardened by our selfish plans. JUST COME. God is Love and love covers a multitude of sins. There is nothing which can separate us from that love. There is no hidden hole we can fall into which his grasp cannot pull us out of. So, Why don’t we come? Have you wondered why your prayer life seems limp and limited? I have a theory, based on observation and personal experience. It is UNBELIEF. We don’t believe he hears, though His word says otherwise. We don’t believe He will do anything about the situation, though our lives always show the fruit of answered prayer. We don’t believe we deserve His help, though we desire it greatly. Our lack of belief robs us of the ability to pray, or to even seek the face of the Almighty. Like the disciples who asked the Lord to guide them in prayer, away from the vain repetition He openly warned them about, we must look to His example. They sought His wisdom and discretion, and he instructed them to COME to God with hearts fully prepared to receive. Come as you are, in your muck and mire, unbelieving and broken, sinful and stained. Come! It is only through the cleansing of His precious life-filled blood, poured out for your scars, that His own still remain a visible reminder. All can come because He sealed the deal. We don’t ever come on our own merit because our accolades mean nothing in regards to our status in heaven. Come as you are, unsure and unsteady, and open your heart. Let praise be the first word. Cry out before the stones do and Praise God as you come to that place of prayer. Lay everything out before Him, knowing that He sees all our limitations yet still accepts us. Be REAL with God in all your forms. If you are a parent, you see your children as they are, but you also see them for what they can be. I believe that because His Word tells us about how intimately the Father knows us and that he sees our end from our beginning (Psalm 139) we can have a bold confidence in our approach. He sees past the façade that we wear, and into the real heart of who we are. He sees what we can be. He sees our future, including all the junk we go through and there is GRACE. As we come, there is mercy, there is provision, and there is hope, because at the end there is Jesus. He is at the finish line, already victorious with a crown waiting for you because you , too, are royalty ( 1 Peter 2:9) His love is so intentional, so pure, so complete, that especially in all of our mess He meets us as the prodigal son was met by His Abba … with open arms. We can come to the place of prayer, knowing we are accepted and loved exactly for who we are. When my heart is breaking, I come to the Father bleeding and scarred from life. He applies an ointment to my battered soul, the salve of love, with understanding and compassion. The raw sores don’t always cover immediately, but they remain, healing slowly. It is a reminder we must approach our Heavenly Father often, soaking up and resting in Him so that we will heal properly. Though there may be a scar it is the sign of redemptive work. 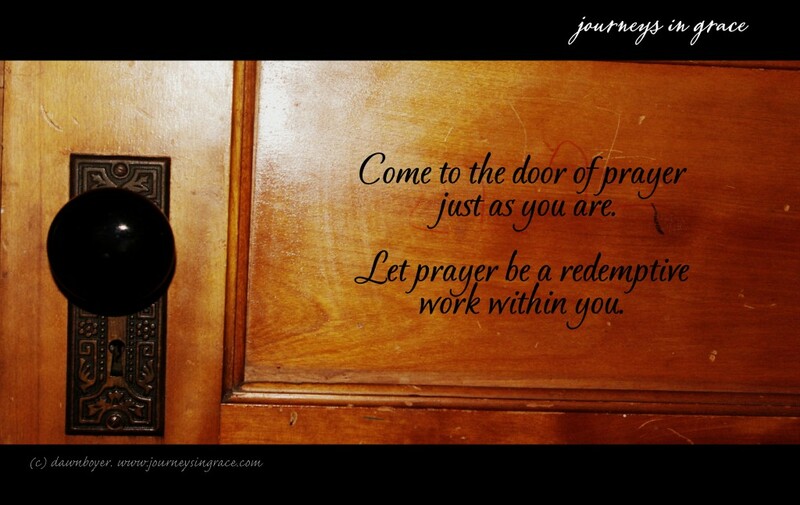 Let prayer be the redemptive work in you. Come to the Father. Simply come. Be open, be honest, be real… BE YOU, because that is who He loves. Let love, patience, and hope have their perfect work. Come to the throne and just be, letting His presence fill and your praises spill. Then as you bless, the rain of mercy waters the cultivated soil in your soul, preparing for the nourishment of fellowship with the Father. This is our diet. This is how he is the bread of life which our body needs. This is how he is the life-giving water which can quench our thirst. See Him as Abba, your sweet Father, who longs to love you and meet your needs. Think of Him as waiting for you to come to withdraw from the open bank account of His provision which is yours to ask for. Come to rest in His arms in your time of prayer. Jesus has given us the example and has patterned the outline our prayers should take. First and foremost, we need to just come. Study his example this week and consider how you approach the throne of God. Prayer is more than a way to commune and talk to God, though it can be as simple as that. It enables us to enlist His help by praying for His will. When we pray, we appeal to his great wisdom, rather than our own limited understanding, to provide for the needs which he longs to meet. The most important step is to just come. The rest seems to fall into place once we take that first step of faith. Remember the aspects of the pattern Jesus set. Come with praise in your heart, pray for his will to be made complete in your life, confess any areas that you have been holding in, seek his hand of provision, release others who need forgiveness in your life as you ask Him to forgive you, and look to His hand of protection as your final authority. What is one area of prayer which you struggle with? Please feel free to leave a note in the comments section. I want to include topics and questions in upcoming additions to my prayer series. Next week we are going to look at some of the other prayers that are listed in the Word of God as a pattern to bring us to the place where our success is not measured just by our faith In Him but by the tangible rewards of a life of diligent faith. Linking up with Jen at the SDG Party! Stop by and enjoy a bit of refrehsment as like-minded sisters dwell together. NextWhat if… everyone took off their mask? Love this, Dawn! I read a great book years ago that really helped me in my prayer life. It was called Praying the Lord’s Prayer for Spiritual Breakthrough by Elmer Towns.